Rare, Exotic, Genuine Antique and Vintage Keys From Around the World. 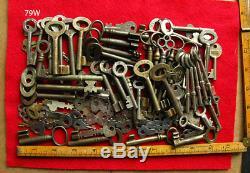 Description: Lot of 100+ old, vintage, antique, skeleton keys. Many industrial keys from old mines, buildings, factories, hospitals, schools, etc. Includes many old padlock (flat) keys. Some may have oil and tarnishes. The key(s) you see are the actual key(s) you receive! Condition may include any of the following: antique wear, patinas and or tarnishes / rust spots, stains, pitting, bends, micro-cracks, modifications (known or unknown), old tape or other material attached to key and minor defects. Some keys may be reproductions of multiple keys. Non-key items used in pictures for display, backgrounds and measurements not included or available for sale unless otherwise noted in the description. Only the keys seen in the pictures are included unless otherwise noted. All dating of keys is estimated since keys can be reproduced at any time. Key length sizes are sometimes rounded off to the nearest 1/16 to 1/8 inches. All keys from a smoke free environment. Keys are generally not cleaned to maintain antique nature. All keys seen are steel, iron or other non-brass metals unless otherwise noted. See our other listed keys! Please contact me in advance of purchasing multiple items. Please ensure your Pay Pal address is correct. I do not suggest purchasing any key as a replacement unless you know the key will fit. The problem with older keys and locks is that the mechanisms and keys often change due to wear. In addition, key measurements can vary greatly due to small differences in bit cuts, depth, shaft diameter and sizing due to metric vs.
My square end keys, including clock keys are sized by metric standards. I suggest consulting a locksmith to confirm lock / key fitting. Contact me first and I will be happy to assist you with any problem. Item(s) must be packed in equal protection as received and be tracked/insured (to prevent loss). I will be happy to correct any issue. Please allow up to 30 days for feedback as we must honor the return period in addition to normal processing time.